My eighth stadium of 2012 was on Tuesday 3rd April 2012 at Hertingfordbury Park in Hertford, Hertfordshire. The match was Hertford Town vs. Broxbourne Borough in the Spartan South Midlands League Premier Division. Hertingfordbury Park is situated to the west of Hertford town centre with the venue in a rural environment out in the fields, a decent way from any housing. It is placed within 1 mile of both Hertford North railway station and Hertford East railway station. The ground has been home to the club since it was formed through a series of mergers in 1908. 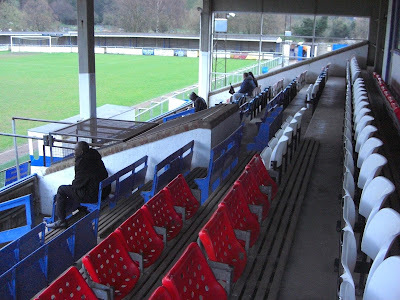 The stadium contains one all-seater stand which sits level with the half-way line on the western side of the venue. 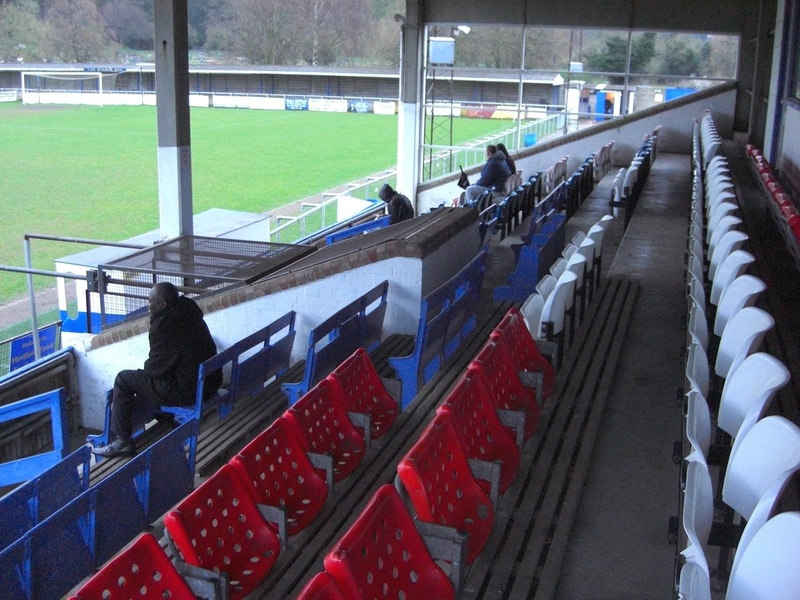 It contains just over 170 seats as well as some additional benches and also contains the players dressing rooms. Adjacent to this stand is a small but pleasant club bar as well as a food outlet. Behind the goal at the southern end of the ground is the Stable End, a covered stand with raised concrete steps which stretches almost the full end of this side of the venue. The remainder of the ground is uncovered standing although there is a small section of raised concrete steps which sit level with the half-way line on the eastern side of the ground. Unlike many grounds at this level the stadium is fairly spacious with plenty of viewing space along the wide concrete walkway which encircles the pitch. Behind the wall at the northern end of the ground there is also a small training pitch where the players were warming-up before the match. The game saw Hertford start brightly as they attacked the Broxbourne goal but in the 14th minute they were dealt a blow when against the run of play the visitors scored from a tidy half-volley from the edge of the box which went into the bottom corner of the net. Just three minutes later Broxbourne doubled their lead when a close-range shot was fumbled by the goalkeeper and a Broxbourne striker tapped in the rebound from a couple of yards out. The visitors dominated the rest of the half but had to be content with a 2-0 lead at the break. The hosts began the second half well and in the 57th minute scored when the away defence failed to deal with the ball and it was poked into the net from six yards out. In the 67th minute Broxbourne had a golden opportunity to restore their two-goal cushion when one of their strikers was presented with an open goal from a yard out. Incredibly he somehow managed to lift the ball over the bar much to the derision of the home fans but two minutes later the away side did get their third goal when they split the home defence and tucked it home. With 15 minutes remaining Hertford got back into the game when a looping cross bamboozled the Broxbourne keeper with the ball coming off the crossbar before being headed in on the line by a Hertford attacker. The home side laid siege to the away goal in the closing stages and in the 88th minute got their reward when one of their strikers danced through the Broxbourne defence and shot low into the net to tie the game at 3-3 which was how it finished with Hertford pleased at their spirited comeback.